Or is one coming or going? This note introduces the use of a magnetometer to establish a heading. The extensions to the solution for navigation purposes is food for thought for the maker embarking on this exercise. A magnetometer measures the strength and direction of the local magnetic field with reference to the module’s orientation. The field is a combination of two factors – earth’s magnetic field and the secondary fields emanating from objects in the vicinity. The Honeywell 3-Axis module, HMC5883L, has reasonable digital compass accuracy (±2° heading) for general purpose commercial and industrial applications. The module’s popularity led Honeywell to license its manufacturing to other companies world-wide. This move resulted in cheaper variations but at the expense of minor deviations in technical standards that will be discussed in a later section of this note. This module serves the purpose of compass readings from a stationary device. Practical navigation requires an integrated accelerometer (for tilt compensation of the digital compass). This requirement opened the market for Bosch to offer a family of such products while Honeywell seems to have other fish to fry. Such a device offers 6-axis readings from the sensors on the PCB. However for the limited purposes of a “Hello World” article, this note will confine the examples to introductory evaluation of the HMC5883L module mounted on a printed circuit board (PCB) with supporting circuitry for the digital compass solution. The extension of the concept even further by adding a gyroscope sensor to the PCB (9-axis readings) serves the demands of hobbyist drones. It is important to note that the ensuing part number references the magneto-resistive module but the interface is subject to the assembly design by the downstream manufacturer. The figure below illustrates the GY-271 PCB with the digital compass module surface mounted on the board. The marking on the module is “DA 5883 8014” which implies that the module is QMC5883L (and not HMC5883L). The HMC5883L module has a label "L883"on its top surface. The QMC5883L part, as shown below, has the second line marking as “5883." The address registers for the two are set differently. One of the I2C scanner utilities (in the References section) can determine the setting or the sample code by DFRobot may be used to cover both parts (as detected during object instantiation). The PCB has an etching of the 3 coordinate axes on the upper edge on the component side to assist with nominal alignment. As shown in the PCB image above, the X-Y plane is parallel to this particular board while the Z axis is perpendicular to the board. This nomenclature should be understood when interpreting the sensor readings for a given alignment. Other boards using an equivalent module may not use the same orientation for the axes. While keeping the PCB in a horizontal (X-Y) plane (with additional leveling aids) may work for short exercises, any involuntary movement is likely to introduce tilting in the event of which the readings will have to be transformed for any practical use. There are very few places on Earth where the magnetic north (derived from compass readings) is aligned to the geographic true north. Magnetic declination is the difference between the values for the magnetic north and the geographic north for a geographic location. For the limited purposes of this note, daily variations in the field strengths owing to ionospheric interactions have no significant impact on the magnetic declination (e.g. < ±0.05° heading). The magnetic north and south are drifting slowly over time. Therefore, to obtain a true measure of direction, the compass heading must be adjusted for the local magnetic declination to derive the true (geographic) north heading. Fortunately, there are authoritative sources for the relevant transformation data on magnetic declination throughout the world. The References section lists one of these sources. The module’s sensor converts ambient magnetic field into electrical signals using patented thin-film alloy compositions. Supporting circuitry on the PCB transforms this output into 3-axis vector values. The assembled board relies on the popular I2C bus for input/output data exchange in accordance with the module manufacturer’s (viz. Honeywell) guidance for support circuitry as detailed in original application notes. One should determine the I2C address for these parts as early as practical. 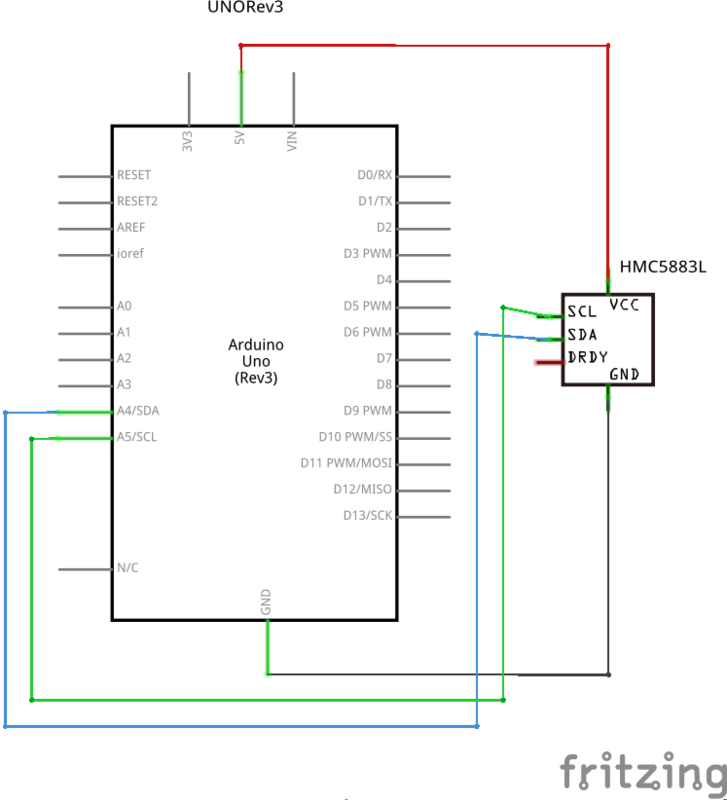 Of course, only one sensor can be used on the I2C bus. The electronic compass module (either HMC5883L or QMC5883L, for example) are surface mounted on a board with supporting circuitry for direct pin connection to the Arduino - pull-up resistors not needed and voltage upper limit accommodated with a matching board. The part numbers for these boards vary (e.g. GY-271, GY-273) based on interface characteristics and axes orientation. For UNO Rev3 boards, the pin diagram (see References) should be consulted for alternate options for the SCL/SDA pins. In fact, the breadboard diagram in this note uses the alternate options (instead of the regular analog pins 4 and 5). The datasheet has full details on the register addresses and the corresponding functions. The GY-271 board does not with soldered pins. There are two sets (one straight through, the other has a 90° bend) of pins in some of the common packages. Since it is preferable to keep the board oriented as indicated with axes annotation on the board, one should choose the right pin for the soldering task that is essentially a prerequisite for the assembly. The output of heading data from the test exercise tracked closely to the compass readings from a smartphone app using a nominal arrangement shown below. The rotation of the baseplate had similar effects on the sensor’s output as well as the smartphone app. only. Again, there are many diverse examples of calibrating the basic electronic compass readings on a standalone basis. I have avoided introducing these techniques in this note so that the beginner is not distracted by the computational techniques and can acquire the knowledge through self-study. There is considerable literature on electronic compass and its extensions for practical purposes. Please consult these documents for more authoritative information. This note is a very simple exercise for self-study purposes. 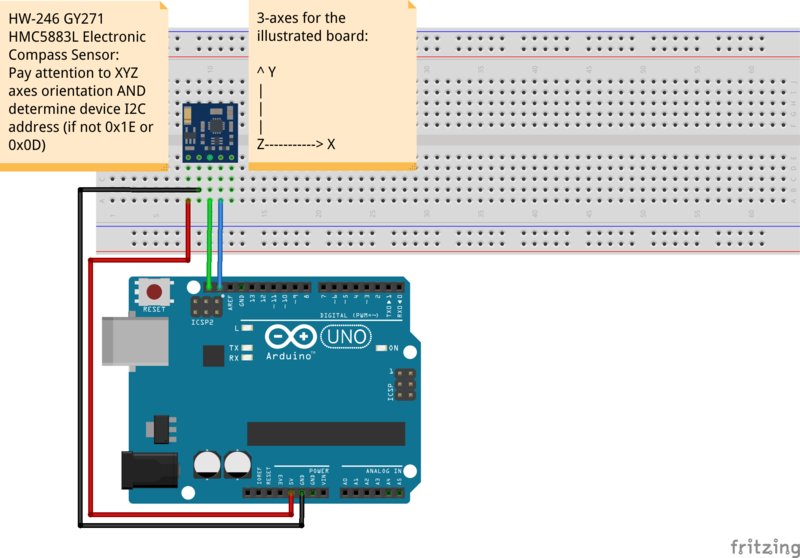 Pin connections between Arduino UNO and GY-271 that servers as the PCB interface for the QMC5883L digital compass module. Working with discrete electronic components for a very long time but still suffering from the occasional dry soldering results. Thanks to DFRobot and Core.